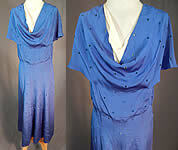 This vintage embroidered eyelet royal blue silk crepe cowl neckline bias cut dress dates from the 1930s. 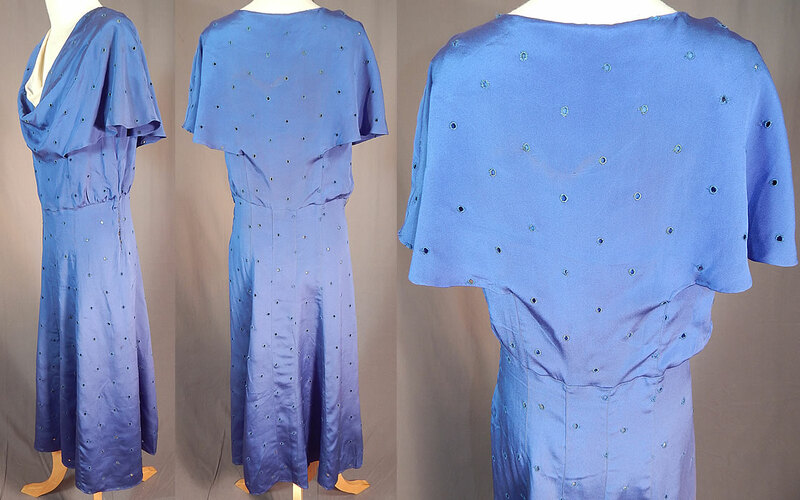 It is made of a royal blue bright color silk crepe fabric with embroidered eyelet eyes, small holes pattern design throughout. This beautiful blue bias cut day dress is a short mid length, with a form fitting cut style, a white silk front insert weighted cowl neckline drape, shawl collar capelet covering the sleeveless armholes, side snap closures and is sheer, unlined. The dress measures 46 inches long, with 34 inch hips, a 26 inch waist and 34 inch bust. It is in good as-is condition, not cleaned with some small staining and discoloration under the arms. This is truly a wonderful piece of wearable art! Buyer pays $7.00 shipping and insurance, USA orders.